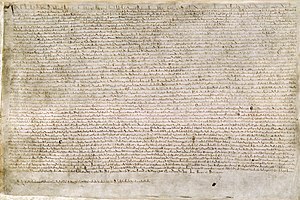 "Commonly called Magna Carta (also Magna Charta; "(the) Great Charter"), is a charter agreed to by King John of England at Runnymede, near Windsor, on 15 June 1215. First drafted by the Archbishop of Canterbury [i.e. Stephen Langton] to make peace between the unpopular King and a group of rebel barons, it promised the protection of church rights, protection for the barons from illegal imprisonment, access to swift justice, and limitations on feudal payments to the Crown, to be implemented through a council of 25 barons. Neither side stood behind their commitments, and the charter was annulled by Pope Innocent III, leading to the First Barons' War. After John's death, the regency government of his young son, Henry III, reissued the document in 1216, stripped of some of its more radical content, in an unsuccessful bid to build political support for their cause. At the end of the war in 1217, it formed part of the peace treaty agreed at Lambeth, where the document acquired the name Magna Carta, to distinguish it from the smaller Charter of the Forest which was issued at the same time. Short of funds, Henry reissued the charter again in 1225 in exchange for a grant of new taxes; his son, Edward I, repeated the exercise in 1297, this time confirming it as part of England's statute law." — Excerpted from Magna Carta on Wikipedia, the free encyclopedia. "Magna Carta" translated by G. R. C. Davis (1963). "Magna Carta. 1215" translated by William Sharp McKechnie (1914) in Albert Beebe White and Wallace Notestein (1915), Source Problems in English History. Harper: New York. "Magna Carta" translated by Ernest Flagg Henderson (1892).